An ex-convict pastor has opened Russia's first church-based rehabilitation center for former criminals. The halfway house offers offenders a home and support - in return for hard work and abstaining from vices. Petr goes about his carpentry with the confidence of a man who's been doing it all his life. But in fact, this is the first real job he's had. He's spent more than half his life in prison for burglary, drug offences and murder. “When I came here I had nothing – no relatives or skills. Some people just gave me the address, but as soon as I came, they allowed me to stay. Now, my life is here,” Petr says. Petr and 30 others live in a church-funded rehabilitation centre on the outskirts of Moscow, the first of its kind in Russia. Those who come – mostly former criminals and drug-addicts, are given bed and board indefinitely. In exchange, they agree to abide by a set of strict rules. The conditions are Spartan. To an extent this is due to the material limitations, but also the ascetic ethos of this place. People who stay here get up at seven, work all day, and then lights out at eleven. Those who are caught drinking or smoking are excluded. 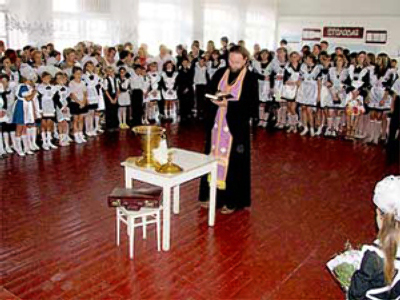 Most of the residents credit Father Aleksandr for saving them. He was a young offender himself, then a wrestler and a soldier, before finding God. When he started the centre more than a decade ago, the church was in ruins, its surroundings a wasteland. “Others tried to do this, but they did not succeed. God chose me to do this, to carry the cross. This is a difficult job – I was once the victim of an assassination attempt. 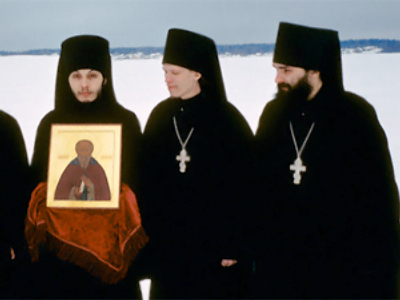 But I have the strength to do it,” Father Aleksandr says. He adds that an iron hand is needed to deal with people more used to living by prison rules. For wrongdoings he assigns chores – from reducing someone's portions at meal times to cleaning toilets, and worst of all, banishment. “He knows everything about everyone. A bad father is one who doesn't punish his children. On the other hand, if you have the smallest problem, down to a torn shoe, he is the man to take care of you,” Petr says. “He is an extraordinary person. Although there is nothing wrong with me, I have been here for years because of him,” another resident, Valeriy says. But, for many like Svetlana, the purpose of rehab is to leave – eventually. “I have found a boyfriend here. Now, all I want is to get a job or maybe study. I want to go back into the world,” she says.